The best way in to park your Corvette at the Reunion is to travel on I-475 to Robert T. Longway Blvd. west which turns into 5th Ave. then south on Martin Luther King. 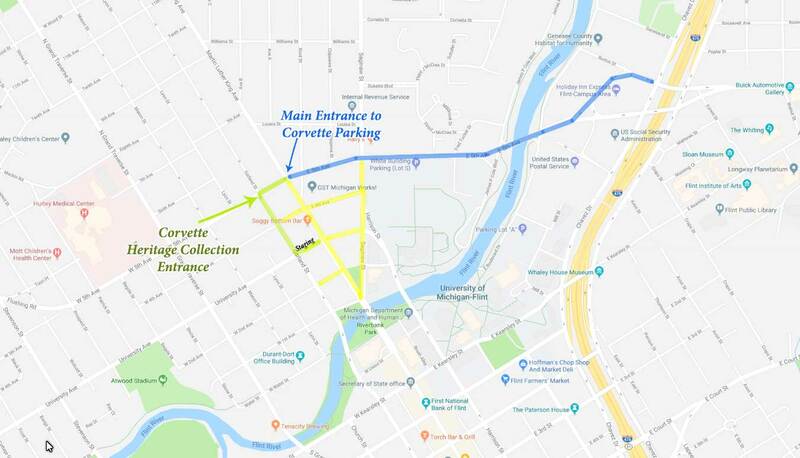 You will find parking all along Martin Luther King Ave. & Saginaw Street from 5th Ave down to the river for Corvettes. Early arrivals (prior to 6 a.m.) will be directed to the staging area on Saginaw Street. Show opens at 6 a.m. The first block of Martin Luther King & North Saginaw Street will be for our early out of town guests as they arrive. Parking is available for approximately 800 Corvettes. Heritage Collection cars will travel a block extra down 5th to Garland and go south to University Avenue for staging.